Riding a motorcycle has been estimated as five times more complex as driving an automobile, and reconstructing an accident can be equally difficult. Part I is written by a professional engineer who has reconstructed over 200 motorcycle accidents and has safely ridden motorcycles for more than thirty-five years. It gives you the detailed information you need to reconstruct and litigate accidents. Part II, Legal Analysis, has been thoroughly updated to include recent cases of interest. 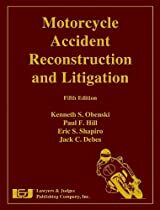 This text also incorporates accident cause factors and identification of countermeasures, commonly known as “The Hurt Report.” This important government study has never been repeated, and is considered to be the ultimate statistical report on what happens with motorcycles and what factors are important in the understanding of motorcycle accidents.